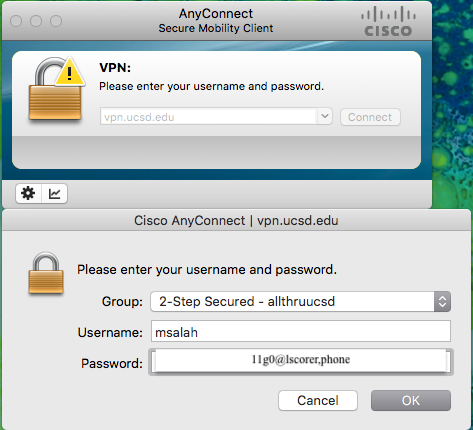 How to use two-step login with VPN connections. As of January 30, 2019, you'll see the following VPN groups listed below when attempting to establish a connection. Faculty and staff who are required to use two-step login to connect must use a group labled "2-Step Secured." Otherwise, an error message will appear and the connection won't go through. Those who aren't required to use two-step login can use any group; however, "2-Step Secured" groups still require use of two-step login. Duo automatically engages your default device to complete the two-step login process. If you don't want to use the default device, consider the options below for entering a passcode or specifying an alternate device. Note: Have your default device ready when you sign in to VPN. If you wait too long to confirm, the VPN will time out and your log in will fail. Enter username and password as usual. Now instead of getting the push, you'll receive a phone call to complete two-step login. This also works if you have multiple devices - for example, two landline phones. Simply add the number of your device to trigger it - for example, phone1, phone2 or phone3. This is called "append mode," and more information is available from the Duo guide.